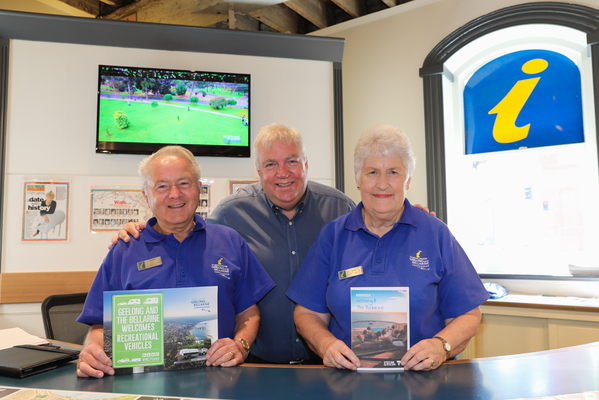 Volunteers like Kay Preston and Thomas Erhardt are the backbone of the region’s tourism industry by providing information to visitors. The pair, who both work with Tourism Geelong Bellarine, have been providing advice to visitors on what they can do and where to go, for 20 and 18 years respectively. They are among 125 volunteers manning eight Visitor Information Centres across the region – which includes Greater Geelong, The Bellarine, Borough of Queenscliffe, Bannockburn and southern Golden Plains Shire. Kay said she is usually based at Geelong’s waterfront booth but is sometimes rostered at the counter at the National Wool Museum in Moorabool Street. She and Thomas said they both enjoyed meeting people from all over the world and helping travellers enjoy their time in the wider region. Visitor Services Coordinator Josh Harris said volunteers at the region’s info centres and booths received more than 17,000 visitors during December. Their enquiries over the Australia Day Long weekend peaked at Avalon International Airport, Geelong, the Waterfront and Queenscliff, while Barwon Heads, Bellarine, Geelong and Great Ocean Road VIC and Market Square were still busy, he said. Statistics gathered at VICs over the recent long weekend revealed 705 groups also made enquiries while visiting the region. Most came from Melbourne or the local area and other parts of Victoria or interstate. International visitors in Geelong for the Australian Day weekend mainly came from Asia, the United Kingdom, Europe and North America. Executive Director of Tourism Geelong Bellarine Roger Grant said the community volunteers providing information to visitors all did “a great job supporting our tourism industry operators” including the region’s 570 members. “The information caravan at Barwon Heads has been a great success this summer, along with the pop-up booth we set up at Geelong’s train station for the Archibald exhibition,” he said.